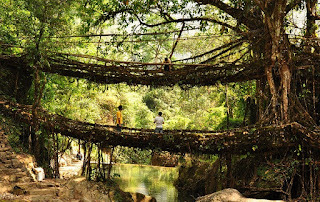 Living Root Bridges are found in Meghalaya. The local people train the roots of living trees into robust bridges across the streams. As the time passes, these bridges become stronger. These unique 'living root bridges' are found in North East state Meghalaya of India. The pliable tree roots are trained to grow through betel tree trunks which are placed across the gap, until the figs' roots take root on the other side. Sticks, stones, and other inclusions are placed with the growing bridge.This process can take up to 15 years to complete. There are specimens spanning over 100 feet. The useful lifespan of the bridges, once complete, is thought to be 500–600 years. They are naturally self-renewing and self-strengthening as the component roots grow thicker. The Living root bridges, some of which are over a hundred feet long, take ten to fifteen years to become fully functional, but they're extraordinarily strong — strong enough that some of them can support the weight of 50 or more people at a time. In fact, because they are alive and still growing, the bridges actually gain strength over time — and some of the ancient root bridges used daily by the people of the villages around Cherrapunji may be well over 500 years old.